Smoky Quartz (or Smokey Quartz) a quartz with a light to dark brown body colour has a highly grounding energy and helps to address inner fears. It stabilizes you and helps you face your shadow. When it is working it can change colour and become lighter. Smoky quartz promotes calmness and practicality. 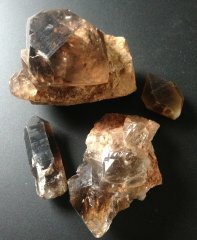 Smoky quartz crystal helps to release old, calcified or fermenting negativity, like grief, anger and despair. It also helps to relieve depression. Smoky Quartz is mildly sedative and relaxing, it dissipates subconscious blocks and negativity on all levels. It is good for grounding and centring. Smoky Quartz is a good balancer of sexual energy. It is said that Smoky Quartz initiates movement of kundalini, enhances dream awareness and channelling abilities. Chakras:Muladhara - the Root Chakra ( 1 ), Swadhisthana - the Sacral or Navel Chakra ( 2 ) and Manipura - the Solar Plexus Chakra ( 3 ).